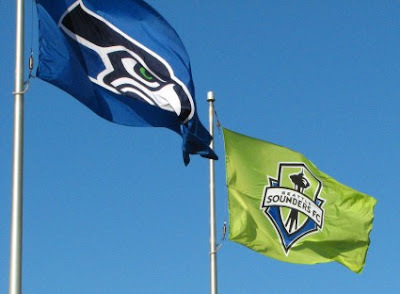 A bright new Seattle Sounders FC flag is flying at the north entrance of Qwest Field next to a Seahawks one. Previously two 'Hawks flags flew, but with the stadium share going full-bore SSFC now has claimed one of the poles for the new crest and colors. I've made one of the photos I took of the flag into a desktop wallpaper that you can download. Pick your size. Here are the two flags flying side by side. 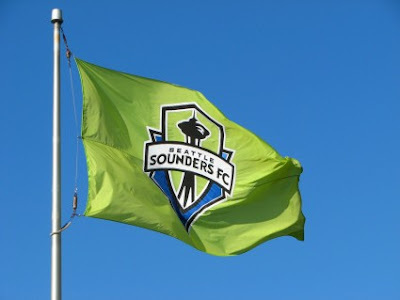 can you make a bigger, wall-paper sized shot of the 'hawks and sounders flag? i love both teams...and it's a cool pic. post it! OK, ask and you shall receive! I've updated the blog with desktops of both flags together.